Horses salivate and foam at the mouth for a variety of reasons. Usually, excess salivation is normal and even desirable. In rare instances, a foaming at the mouth may indicate a medical issue that requires a visit from the vet. To determine the cause of your horse's excess salivation, take note of when and how often there is foam on its mouth. If you think the foamy salivation may indicate a health problem, contact your vet as soon as possible. It is absolutely normal for a horse to secrete foamy saliva during physical exertion. In fact, this is often considered a positive physical trait because it indicates the horse is relaxed and being ridden correctly. In horses that are tense or have bad posture, the salivary duct is inhibited and their mouth dries out. Before competitions, many owners feed their horse sugar to stimulate the salivary gland and "soften" the mouth. Excess, foamy salivary production also occurs during and after eating. Saliva contains enzymes that help the horse to break down food. The more difficult the food is to digest, the more salivary production there will be. Sugar and carrots are both likely to induce excess salivation. Horse's teeth are always growing and being ground down. If they are ground down incorrectly, sharp edges may appear and create dental problems. If your horse is salivating more than normal or you notice blood in its saliva, it is possible it may have ulcerated or infected gums. Speak to your vet as soon as possible to address this issue. Foaming at the mouth can sometimes indicate that a horse has consumed poison. Poisons that cause excess salivation range from deadly chemicals to toxic plants. In addition to foaming at the mouth, a poisoned horse may also be feverish, sweaty or have a cough. Red clover is common plant toxin that can cause Black Patch Disease. Black Patch Disease is very dangerous because excess salivation is often the only early symptom and owners don't realize something is wrong until it is too late. If you suspect your horse has consumed poison, call the vet immediately. Although it is uncommon in horses, excess salivation can sometimes indicate rabies. In addition to foaming at the mouth, rabid horses are extremely aggressive. They may seem restless, make strange vocalizations, buck or bite. 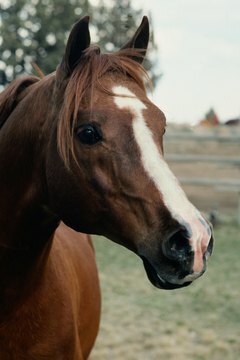 Horses can become infected after being bitten or scratched by a rabid dog, raccoon, skunk, fox or bat. Once the infected horse becomes symptomatic, death is inevitable. It is best to vaccinate your horse against rabies to protect it from infection.